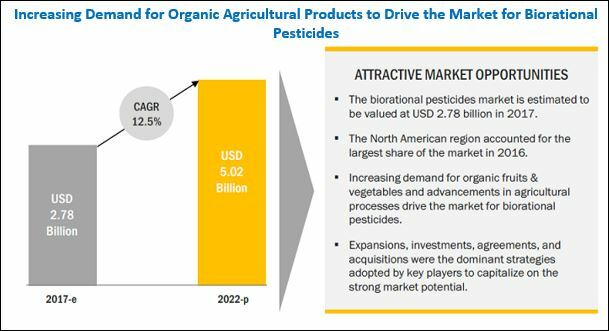 [162 Pages Report] The market for biorational pesticides stood at USD 2.48 Billion in 2016; it is projected to grow at a CAGR of 12.5% from 2017, to reach USD 5.02 Billion by 2022. The base year considered for the study is 2016, and the forecast period is from 2017 to 2022. The basic objective of the report is to define, segment, and project the global market size for biorational pesticides on the basis of type, source, mode of application, crop type, formulation, and region. It also helps to understand the structure of the biorational pesticides market by identifying its various segments. The other objectives include analyzing the opportunities in the market for stakeholders and providing a competitive landscape of market trends, analyzing the macro and micro indicators of this market and projecting the size of the biorational pesticides market and its submarkets, in terms of value as well as volume. This report includes estimations of the market size in terms of value (USD million). 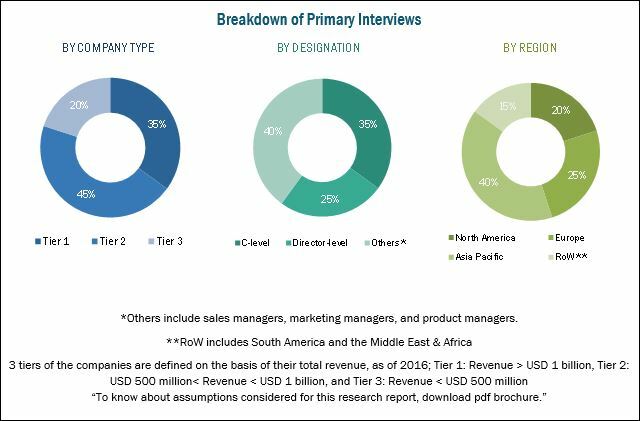 Both, the top-down and bottom-up approaches have been used to estimate and validate the size of the global biorational pesticides market and to estimate the size of various other dependent submarkets in the overall market. The key players in the market have been identified through secondary research; some of these sources are press releases, paid databases such as Factiva and Bloomberg, annual reports, and financial journals; their market share in respective regions has also been determined through primary and secondary research. All percentage shares, splits, and breakdowns have been determined using secondary sources and verified through primary sources. The figure below shows the breakdown of profiles of industry experts that participated in the primary discussions. Key participants in the supply chain of the biorational pesticides are the product manufacturers, end-use industries, and raw material suppliers. The key players that are profiled in the report include Valent Biosciences (US), Bayer (Germany), Monsanto BioAg (Germany), BASF (Germany), DowDuPont (US), and Syngenta (Switzerland). The rise in concerns about food safety has led to farmers exploring new environment-friendly methods to replace or supplement the current chemical-based practices. The use of biorational pesticides has emerged as a promising alternative to chemical pesticides. Promotions by government organizations for the adoption of biorational pesticides and their low cost compared to that of chemical pesticides are some prominent factors that are expected to drive market growth through the next five years in most regions. On the basis of type, the biorational pesticides market was led by biorational insecticides segment in 2016. It is one of the most largely commercially available types of biorational pesticides. 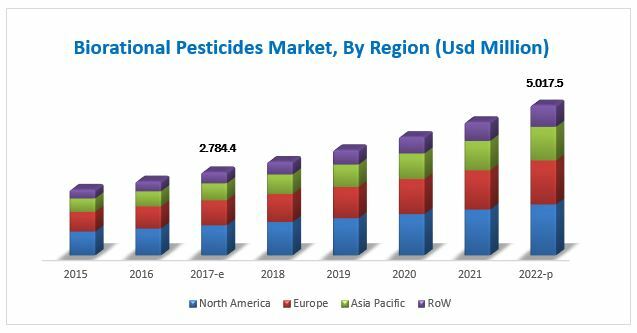 North American countries are expected to become major markets owing to the high awareness among farmers and this contributes to the growth of the global biorational pesticides market in the near future. The botanical segment dominated the market in 2016. Botanical pesticides contain naturally occurring substances that control pests using a non-toxic mechanism. The substances that control diseases in this category include pyrethrin, azadirachtin, and plant extracts, while botanical oils such as neem oil, canola oil, and jojoba oil drive the growth of this segment. The biorational pesticides market, on the basis of mode of application, is segmented into foliar spray, soil treatment, and trunk injection. The foliar spray segment covers the largest market share as direct application on leaves through foliar spray is the most effective way of supplying nutrients to plants, which results in enhanced productivity and greater yield; this also leads to rapid absorption and uniform supply of the nutrients to each part of the shoot and root. North America accounted for the largest market share for biorational pesticides in 2016, owing to the increase in demand for biorational pesticides in countries such as the US and Canada. However, Asia Pacific is projected to be the fastest-growing market during the forecast period, due to increased awareness and increasing production of organic fruits & vegetables. In organic production systems, biorational pesticides represent the most significant crop protection tools that a grower has to produce a quality crop. While their use is not overly complicated, the application of some biorational pesticides may require a high level of understanding and knowledge of the diseases and pathogens that they are designed to control. As with any disease management program, proper timing and application are essential to ensure efficacy. Biorational pesticides may not perform as quickly as some synthetic chemical pesticides. However, biorational pesticides are generally less toxic to the user and are mild on non-target organisms, making them desirable and sustainable tools for disease management. Companies such as Valent Biosciences (US), Bayer (Germany), Monsanto BioAg (Germany), BASF (Germany), DowDuPont (US), and Syngenta (Switzerland) have acquired leading market positions through the provision of a broad portfolio, catering to the varied requirements of the market, along with a focus on the diverse end-user segments. They are also focused on innovation and are geographically diversified.